While Anderson Cooper was tweeting and posting photos to his IG account about his home in Brazil being featured in the August issue of Architectural Digest, the very capable John Berman was in the AC360 anchor chair. Please click on the above link for the original article and slide show. 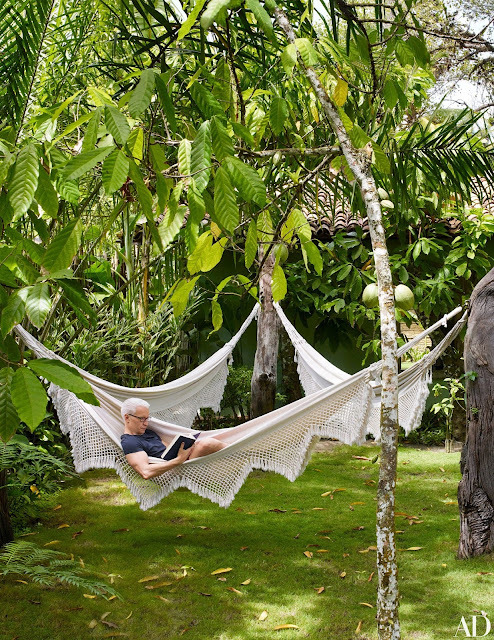 Lord knows it wasn’t convenience that inspired Anderson Cooper to build a home in the Brazilian town of Trancoso. Situated on the Atlantic coast in the state of Bahia, the village is a 14-hour schlep—including a flight change and a healthy car ride—from the CNN anchor’s base in Manhattan. Cooper first visited the idyllic hamlet in 2013 on a holiday with his partner, nightlife impresario Benjamin Maisani, and their friend Andy Cohen, the puckish television personality and Real Housewives sire. “Within a day I was fantasizing about buying a house there,” the well-traveled journalist recalls. “Ben thought I’d lost my mind, and Andy, who is encouraging about almost everything, thought I was nuts, too." Bordered on the north and south by petite one-level houses dating back some 500 years, and to the east by a 16th-century Catholic church set on a precipice above the ocean, the Quadrado is the social and spiritual heart of Trancoso. “Most people want homes on the beach, but you can find beautiful beaches all over the world. The Quadrado is what makes this place so singularly compelling. I had to be there,” says Cooper, who, on that first visit, soaked up the scene on the square from his perch at Uxua Casa Hotel & Spa, a resort made up of 11 discreetly fabulous guest cottages. To immerse himself in Trancosan life, Cooper found the perfect cicerone, designer, and local real-estate expert in Wilbert Das, the co-owner and mastermind behind Uxua. Das arrived in Brazil seven years ago, after resigning from his role as creative director of the clothing brand Diesel. “A friend in Italy had mentioned this place, and when I got here, I somehow felt like I was home,” says the fashion fugitive, echoing Cooper’s tale of enchantment. With Das’s guidance, Cooper secured one of the Quadrado’s rare vacant lots—a long strip of land peppered with a lush assortment of mango, cacao, jackfruit, banana, and açaí trees. Das devised a compound of four pavilions set along a meandering path that begins on the border of the town square and terminates in a stunning efflorescence of rain forest. The first cottage—colonial in style—contains the conjoined living and dining rooms, a kitchen, and a veranda for alfresco meals. The two center buildings are guest bungalows—one of brick, the other built using pau a pique (or “wattle and daub”), a process whereby clay is layered over a wood frame. The last structure, tucked away near the pool, is a two-story tree house of reclaimed timber planks that comprises a master suite above and an outdoor living room and bar below. Per local custom, the estate is known simply as Casa Anderson. “We weren’t obliged to build in a purely historical style, but we felt it was important to create something attuned to the local culture,” Das explains of the compound, which was constructed largely of materials salvaged from an abandoned Bahian farmhouse. The decor—a mix of vintage finds, items from Das’s Uxua Casa collection, and bespoke pieces crafted by local artisans—reflects his and Cooper’s predilection for unpretentious, authentic furnishings tied to the rich traditions of the region. Likewise, the artworks that adorn the walls include a collection of antique Mexican votive paintings and a group of Bahian shrines. There’s not a Damien Hirst or an Anish Kapoor in sight. The house in Trancoso looks absolutely stunning. It's the perfect tropical retreat for AC and Ben, away from the bustle of NYC. Good for them. John Berman opened the show by mentioning the Attorney General will not press charges on Hillary Clinton and there will be a Hillary and Bernie Sanders meeting next week with a possible Sanders endorsement. But the lead story was Trump meeting with Gingrich, a possible Veep. I changed the channel. Checking back later I saw the start of a 6-person panel. The first question went to Kaleigh McEnany and I left again. The second segment started with the news of the Attorney General, Hillary and no charges. The same panel started again and I went back to Hayes. 360 showed video of Hillary's speech in Atlantic City near the start of the third segment, while audio of Berman saying "...she didn't talk about the FBI email investigation..." A clip of Hillary dissing Trump's business practices was played and then Berman talked to Jeff Zeleny for more info. I thought they didn't focus enough on Trump's business failures. Fortunately, a very good report followed detailing Trump's Atlantic City failures, the bailouts and the bankruptcies. Because most of the next segment was a panel discussion, I missed most of the segment. Very last in the first hour was coverage on Alton Sterling's death in Baton Rouge LA at the hands of the police. Berman conducted a Q&A with Martin Savidge in Baton Rouge. I did not watch the second hour. YES, JUST A QUIET LITTLE GET AWAY. WORLD? NO MORTGAGES, NO TAX LIABILITIES, VERY UNLIKE NEW YORK OR WASHINGTON. AC SEEMS TO BE BUYING A LOT OF REAL ESTATE, AND ALL DIFFERENT TYPES OF REAL ESTATE. WELL SOMEONE HAS HIS RETIREMENT PLANNED. Beautiful home in Trancoso--wouldn't surprise me if AC decided to retire there at some point since Brazil has always been one of his favorite places. WITH A LITTLE PROMPTING BY THE GOP, WHO ARE VERY AFRAID OF LOSING CONTROL....WELL THEY'VE LOST CONTROL ANYWAY WITH "THE IDIOT." I'VE STOPPED WATCHING THE NEWS. THERE ARE JUST SO MANY RERUNS BEING SHOWN DURING THE SUMMER, WITH THE SAME THEME. SAME SCENARIO AND SAME OUTCOME. IS THE CONFEDERATE FLAG STILL FLYING IN SOUTH CAROLINA AND MISSISSIPPI? DON'T TELL ME. DON'T SPOIL IT. I THINK I KNOW THE ENDING. JUST LOOKS LIKE THE TYPE. I HOPE SHE WINS.....NO I'D NEVER BE AN IMPARTIAL JUROR. AC lives the good life. Wealth is what makes it in the world... Ben is very lucky...lol. Nice to see Ben in a pic again. He is definitely part of the 1% and has the attitude for it. Can you say flaunt.